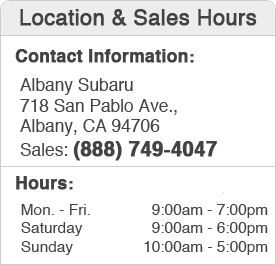 Here in Albany, CA, we know that Subaru is an industry-leader in the areas of safety and dependability. After all, 96% of Subarus sold in the last 10 years are still on the road. That means your new Subaru is built to last for thousands of miles and many joyful years behind the wheel! Of course, Subaru stands by the engineering, craftsmanship and unrivaled quality of its fleet of vehicles. That's why all new models are protected by a 3-year/36,000-miler bumper-to-bumper and 5-year/60,000-mile powertrain limited warranty. There's no question that these basic warranty plans provide comprehensive coverage for the duration of a three-year Subaru lease. But, you might need additional protection if you're a Subaru owner in the Bay area! Thankfully, Albany Subaru is offering a 10% discount on an Extended Warranty protection plan to Subaru owners throughout Oakland, Walnut Creek, Berkeley, Albany, CA and all of the San Francisco Bay Area. It's simply the perfect option for drivers that tend to rack up the miles on the odometer whether commuting, carpooling or chasing adventure! Your Extended Warranty coverage provides extended protection for nearly 1,000 parts including your vehicle's engine, transmission, suspension, steering brakes, cooling and fuel system and air conditions. You can upgrade to the Gold Plan to enjoy exclusive benefits such as 24-hour emergency roadside assistance, road hazard tire protection and locksmith service! With little to no deductible, you'll have the peace of mind to enjoy all that your Subaru has to offer! 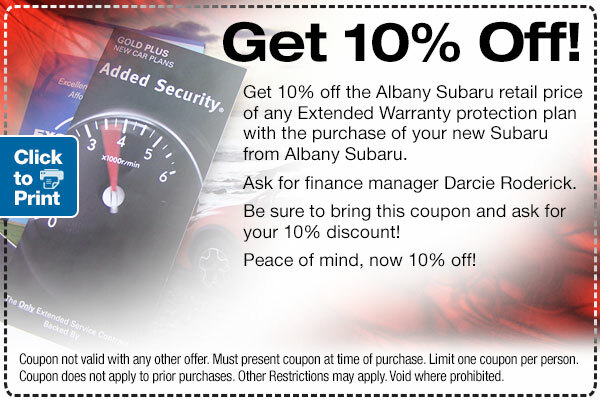 Take advantage of a 10% discount on Subaru's Extended Warranty protection by simply visiting us in Albany, CA to get started today!